At first look, you may think to pick one or the other, yet the truth of the matter is that utilizing a blend of both is the route to success. Emulators are now available for every one of the common operating systems and are commonly utilized both amid manual and automation testing. Emulators are powerful tools that are generally available for free from the OS merchants and give a rich set of development tools. However, emulators can never be identical to the real target environment and as mobile applications are focused on real devices, so testing on real devices is considered to be important to guarantee the maximum application quality. This is like the pilots trained on emulators to test such circumstances as they cannot simulate utilizing real aircraft due to cost or risk coefficients. Price: Emulators are free and provided as a part of the SDK with the new OS. Simple: Simply download the software, install on your system and you are ready to go. Easily Upgradable: Emulators can be easily upgraded to the latest software without any hassle. Fast: As emulators are normal client software which runs locally on your system, therefore, they are considerably quicker than the real devices connected to the network or in the cloud. Increased Risk: While using emulators you are not actually testing on the same devices with hardware resources that will be utilized by the end users. This implies that regardless of whether the application breezes through tests on emulators, you still cannot fully ensure that it will actually work on the real devices as well. 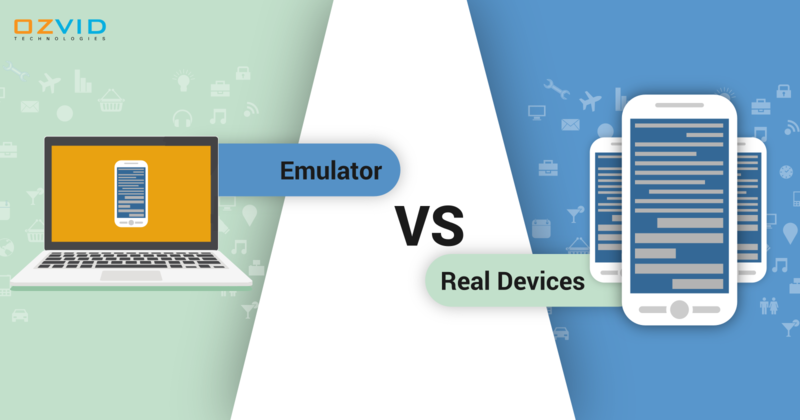 Hardware and Software Differences: Emulators are actually a “plain” form of the OS and do not mirror the particular hardware and software features of real devices. Moreover, emulators are not updated according to the new devices being released in the market. Different Network Environment: In terms of network, mobile emulators run on the system and access the Internet via company firewall. This is not how real devices work and this difference could also affect application behavior. No way to Test Network Interoperability: In mobile testing, it is also critical to test the effect of network-related events on the application like the call, text message, etc. We cannot test this on the emulators. Sensor Testing: Emulators do not support sensor testing due to the absence of sensors like accelerometer, gyroscope, magnetometer, proximity, etc. Interoperability Testing: Testing on real devices is mostly conducted in a live mobile network. Reliability: Real handsets, when used for testing ensure accurate results without any false positives or false negatives. Performance Testing: Easier to expose performance related issues with real handsets, as well as the defects which are mostly due to the device itself or its environment. rue User Experience: Testing on real devices is the best way to get a fair idea about the user experience, also considering other factors like the memory usage, CPU, screen size, etc. for a specific device. Cost and Logistics: According to the testing best practices, testing should be conducted on up to 30-40 devices in the market and replacing 30% of each quarter to stay up to date. Cost of procuring and managing these devices is quite high. Security Issues: If you are using devices connected locally to your workstation, you will have to make sure that USB ports are open. Moreover, mobile devices can be easily stolen, and also provide a way of unauthorized access to your internal network. We have seen both the pros and cons of utilizing emulators for testing in detail. We have found out about the significance of testing on real devices keeping in mind the end goal to ensure the highest quality. Consequently, with regards to settling on the emulators or real devices, it creates the impression that the ideal testing answer for mobile testing is not "either-or" yet rather "a mix of both."